“You can’t judge a book by its cover” has never rung so true! This small and unassuming little booklet holds a wealth of practical, “how-to” information. Based on a case study done by a Tellington TTouch instructor and a veterinarian owner, this manual provides step-by-step instructions for helping to bring a horse back into physical function after a neurological issue. This study of using TTEAM for the rehabilitation of horses with neurological deficits started through the efforts of Dr. Mark Meddleton and his wife, Becky. Becky’s horse, Jewel, was severely affected by EPM and Dr. Mark was trying all the forms of experimental medication. During the times that the medication seemed to be working, Becky decided to try TTEAM to rehabilitate Jewel. Becky applied her basic knowledge of TTEAM and was impressed by what she was observing with Jewel. Becky and Mark came to a TTEAM workshop at Galisteo Creek Farms in April, 1999 to learn more and to talk with Linda to see if TTEAM would cooperate in a study of rehabilitating horses with EPM. Becky explained to the group that initially she had thought that only the ground exercises would help, but after talking with TTEAM Instructor Carol A. Lang, she tried the TTouch and realized it too was a key element. To initiate the study, Linda and Carol met with Dr. Mark and Becky at a client’s farm. A neurological exam was performed by Dr. Mark on three horses. TTEAM techniques were shown the horses’ owner and Dr. Mark set up a basic schedule of rehabilitation with the owner. In a few weeks, Carol met with Dr. Mark and Becky at this client’s farm. Dr. Mark reexamined the horses and both he and the owner were sure that improvement had been made. Carol taught the owner more TTEAM techniques and Dr. Mark scheduled another evaluation of the horses. In June of 1999, Dr. Mark, Becky and Carol worked with Jewel and Mark’s horse, Dugan, who also had been diagnosed with EPM. Dr. Mark did a neurological exam of each horse. Then, as they did TTEAM and TTouch with both horses, Mark, Becky and Carol discussed which techniques were working, the timing of the sessions, the sequence of TTouch and the work in the TTEAM Confidence Course. They also made a first draft of a checklist for the owners to keep track of their horses rehabilitation program. Carol accompanied Dr. Mark and Becky on visits to at least three clients who had horses with nuerologic difficulties. Each owner was shown TTEAM techniques and Becky recommended the rehabilitative process. Dr. Mark’s scheduled follow-up neurological in order to track progress. Becky reported that the percentage of improvement of the trial horses was very high and that the owners were very happy with the results. To continue the development of a protocol that Dr. Mark planned to present to the AVMA, Carol met with Dr. Mark and Becky and TTEAM Practitioner, Kirsten Henry several times over the next year. They video taped how to do TTEAM techniques, developed a modified Confidence Course and did many trials with TTEAM techniques, in particular the use of wand and lead, the TTEAM bodywrap and TTouches. Carol prepared a booklet of TTEAM techniques that would be distributed to participants of the study. Dr. Meddleton reviewed this booklet and made suggestions from his perspective as a veterinarian. Hoping to receive a grant, Dr. Mark presented their protocol to a veterinary conference in the Fall of 2000. The evaluation and advice offered about their study gave Dr. Mark and Becky new insights and direction. However, Dr. Mark’s veterinarian practice was expanding so much that their time for continuing this study was curtailed. We know that TEAM has been very effective in helping horses rehabilitate from neurological deficits. 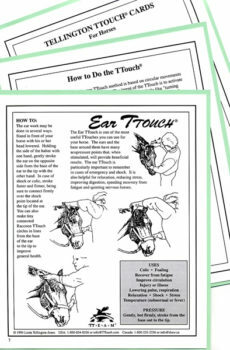 We offer this booklet as a guide to Tellington TTouch Practitioners and others who will use the TTouch Method to facilitate their horses’ rehabilitation. Spiral bound paperback, 48 pages.